My husband has been begging me to make something with the boxes of puff pastry we have in our freezer. But I've been on a scratch baking kick, so I've been resisting opening those boxes. But this weekend is a crazy mix of parties, business trips and errands, so for the sake of my sanity, I'm breaking open that box. Why not make my life easier? Another thing my husband always seem to buy are Cranberry walnut rolls...which I will make next week... but I figured it's such a great flavor pairing for this time of year why not put it into a light and flakey cookie!? Making palmers with puff pastry is one of the easiest things to do. They're tasty, impressive and oh so simple. All you need is sugar and puff pastry! Allow the frozen puff pastry to thaw for the allotted amount of time on the box. You don't want to try and roll out frozen dough, they'll be cracks galore. So let it thaw before you start working. To make the filling i placed the walnuts and cranberries in a food processor and pulsed till they became pea sized pieces. I threw that into a bowl and mixed in a cup of sugar. Now for the Puff pastry. Once thawed, sprinkle a good amount of the sugar mixture on your board and place the pastry on top. Gently unfold it and sprinkle more of the sugar mixture on top, then roll baby roll. Roll it out to a 16X12" rectangle, adding more sugar if needed. You basically want to press your sugar filling mixture into the dough. Then its time to roll the dough in on itself like a cinnamon roll. Start with the long side of the rectangle and roll towards the middle. Then roll the other side into the middle. It’ll kind of look like a scroll! Cut this log into 1/2” slices and place on a parchment lined baking sheet. Bake for 6 minutes on one side then flip each cookie and bake again for 3 minutes. Allow to cool before digging into these crunchy holiday treats! 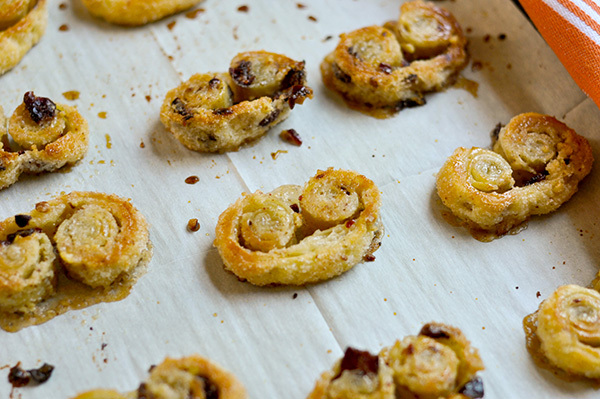 These are fancy enough for a cookie swaps or office holiday party but easy enough so that you won't be pulling out your hair this holiday season! Enjoy! Preheat the oven to 450F. Line 2 large baking sheets with parchment. Place dried cranberries and walnuts into a food processor. Pulse till the walnuts and cranberries are chopped into pea sized pieces. With your hands, mix the chopped cranberries and walnuts with the sugar and cinnamon. Once the puff pastry dough has been defrosted, spread a layer of sugar on your work board and place the unfolded dough directly onto the sugar. Add more sugar onto of the dough, about 1/4 cup and begin rolling. Roll the dough to a 16X12" rectangle, adding more of the sugar mixture as you go so that it evenly coats the dough. 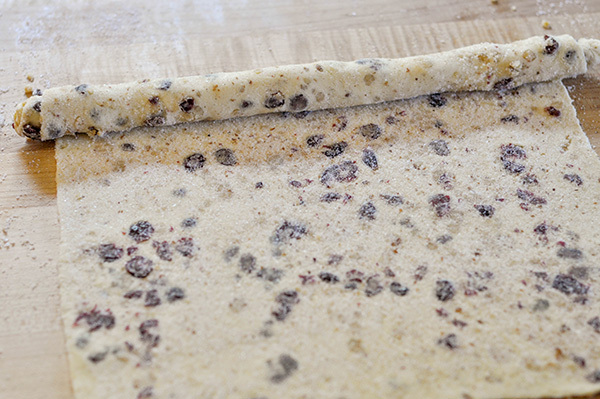 The rolling will help press the sugar, cranberries and walnuts into the dough. Once you reached the desired size, begin to roll one side of the dough into the center. Roll the other side of the dough to meet the first roll in the center. Cut 1/2" slices. Place the slices on a parchment lined baking sheet face up. Bake for 6 minutes. Flip then bake for another 3 minutes. Allot to cool slightly to allow for the melted sugar to set and create a crunchy crust.